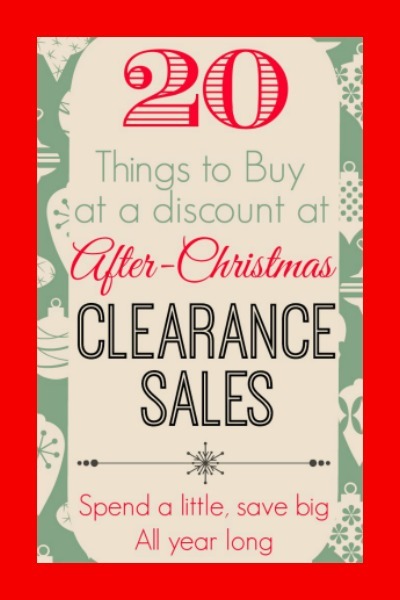 This post is sponsored by Cost Plus World Market and it contains affiliate links, but I only recommend companies and products I love. Read my full disclosure policy here. 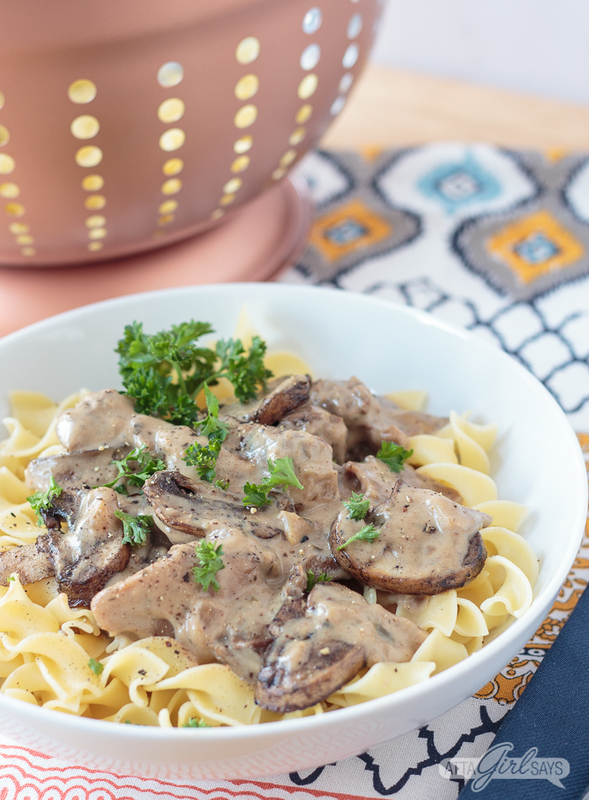 For those days when you’re craving comfort food without the calories, try this easy light slow cooker beef stroganoff. 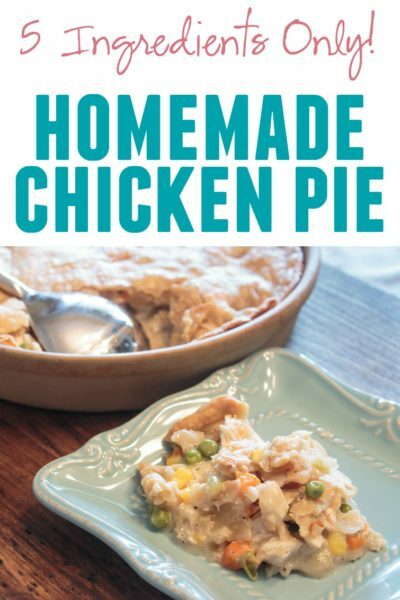 It has the rich flavor of the classic dish without the extra fat and calories. 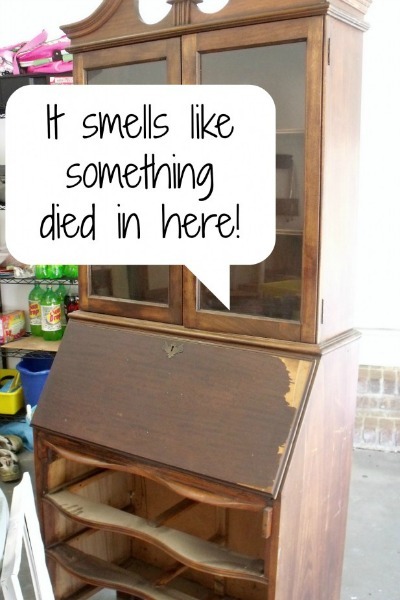 What do you do when your oven breaks in the middle of winter and it’s going to be weeks before you can get it fixed? 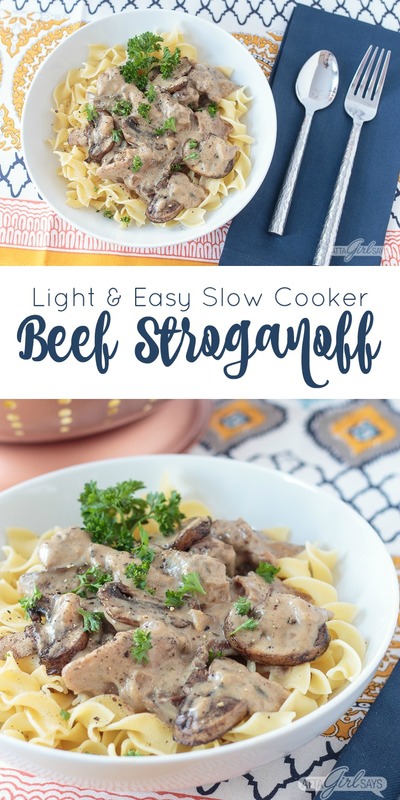 Did I mention that this slow cooker beef stroganoff recipe has been lightened up and has fewer calories and less fat than the classic Russian dish. But it’s still stick-to-your-ribs comfort food for cold winter days. A serving, including a cup of egg noodles, is 11 Weight Watchers points, if you’re counting like my husband and I are. This is such a satisfying meal — meaty, rich and with carbs! — that doesn’t leave you feeling deprived or with any after-dinner cravings like so many lower-calorie recipes. I served ours with some carrots since veggies are “free” on Weight Watchers. 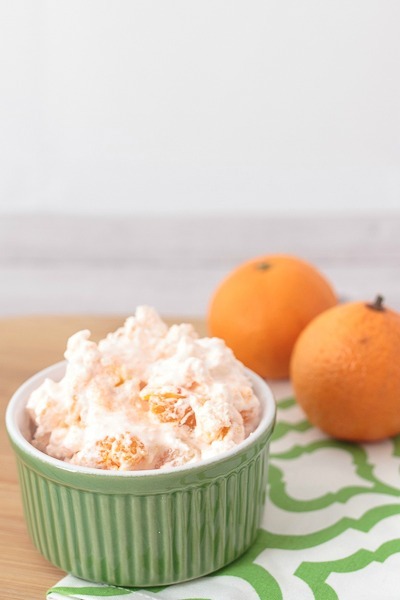 I stopped by my local Cost Plus World Market store in Winston-Salem to pick up a few key ingredients for this recipe, plus some pretty things for my kitchen since I had a coupon and a birthday reward! 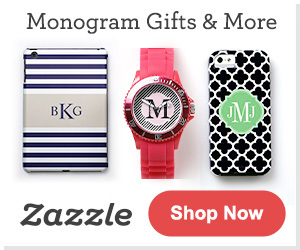 They have great cookware, chef’s tools and serving pieces to elevate your entertaining and everyday meals. 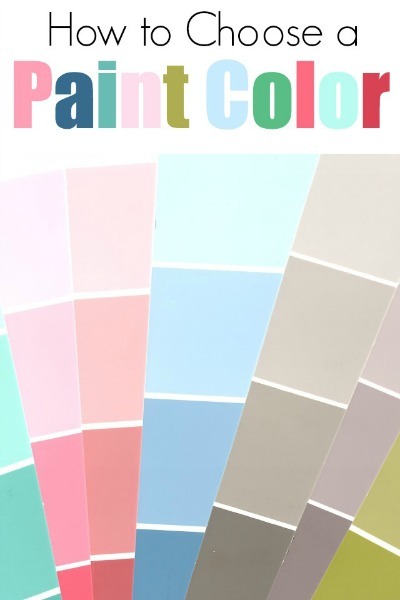 Find you local Cost Plus World Market store here. For this recipe, you’ll need a pound of lean beef, like top round roast or round tip roast, trimmed with the fat removed. Season the beef with salt and pepper. Throw that into the slow cooker with 2 or 3 cloves of minced garlic and a chopped onion. 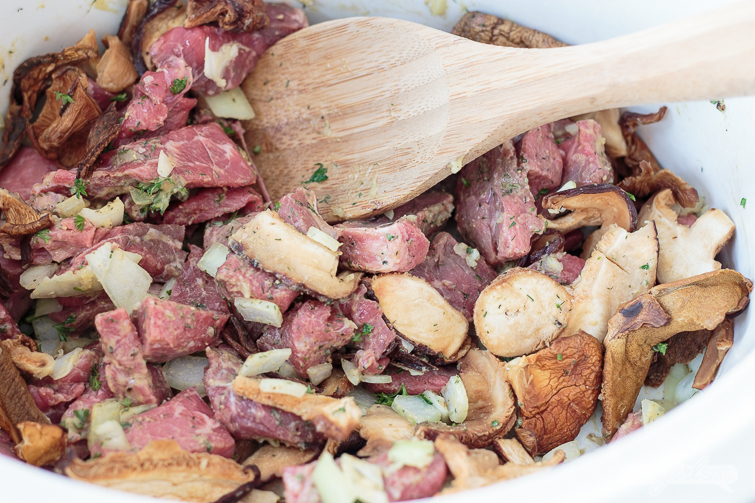 Give everything a good stir to coat the beef and mushrooms. In a separate bowl, whisk together flour and beef broth until incorporated. Then slowly pour it over the meat. 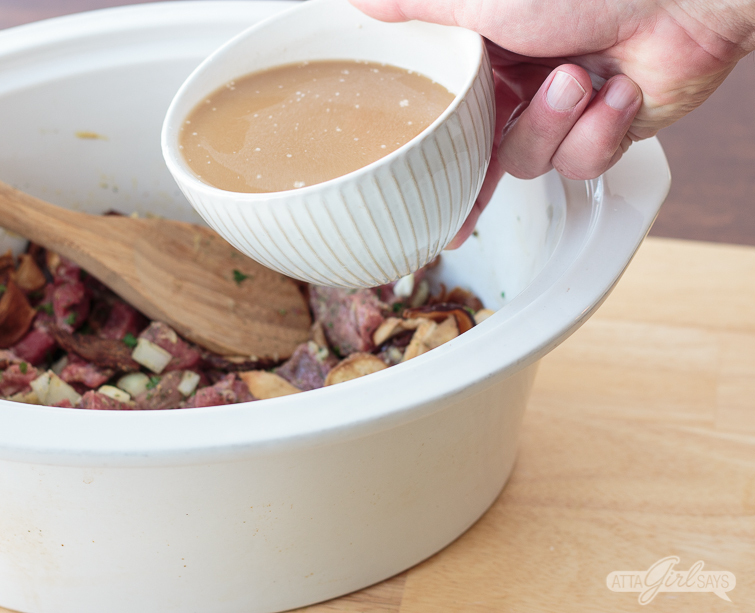 Stir again, then pop the lid on your slow cooker and cook on high for 1 hour. 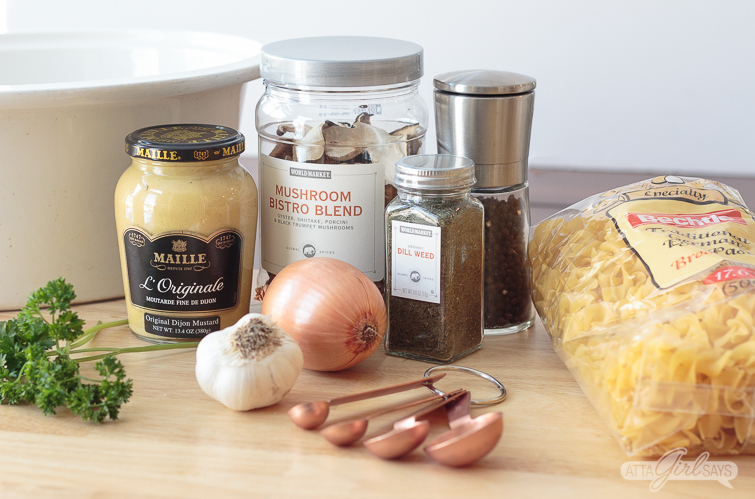 After an hour, you can remove the lid and give the slow cooker beef stroganoff a quick stir. But resist the urge to peek too often! Lower the heat to low and cook for about four hours. The beef will get more tender the longer you cook it, so you can leave it for longer than four hours. 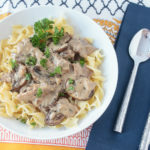 The sauce thickens as the slow cooker beef stroganoff cooks, so you do want to make sure that it doesn’t overcook and get too thick and stick to the crock. When the dish is done, remove the lid and turn off the heat. 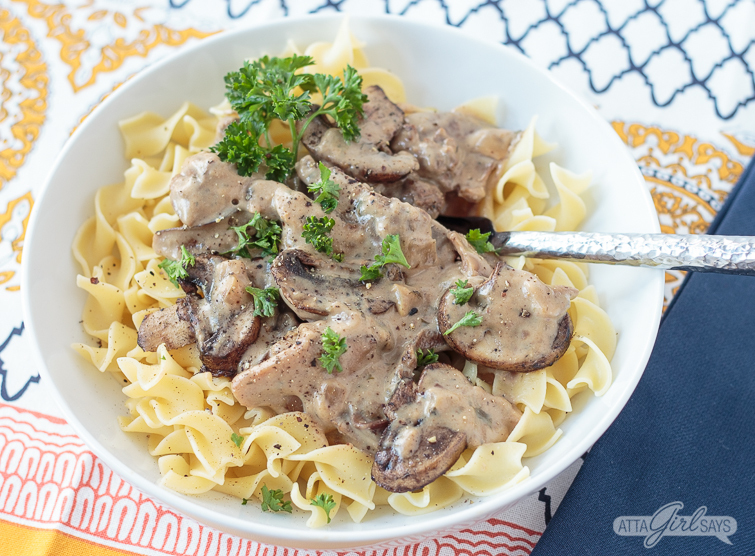 Allow the beef stroganoff to cool slightly while you’re cooking the egg noodles. Just before serving, add light sour cream (I don’t recommend non-fat sour cream) to the beef stroganoff and stir until blended. Dish up some noodles, top with the beef stroganoff and dig in! Trim fat from roast and cute into thin slices. Season beef with salt and pepper. 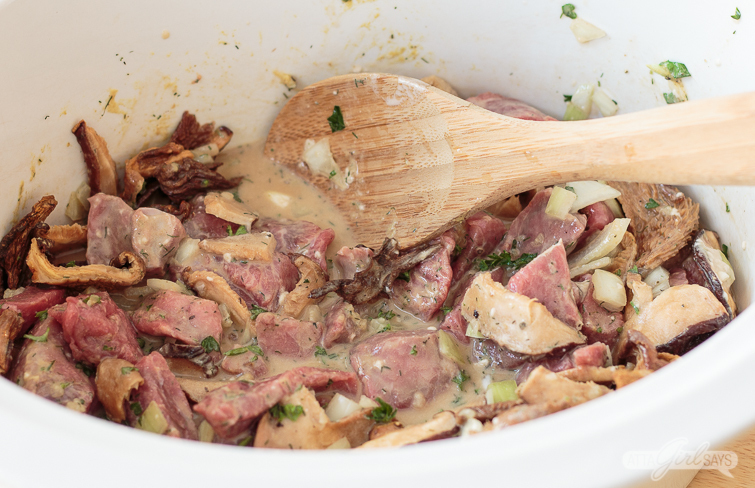 Combine beef, onions, garlic, dried mushrooms, dill and parsley in a slow cooker. Stir. Measure flour into a separate bowl or measuring cup, and slowly add beef broth, whisking until incorporated. Pour broth mixture into the slow cooker and stir. After 1 hour, remove the lid and stir the beef stroganoff. Lower the heat to low and cook for four more hours. 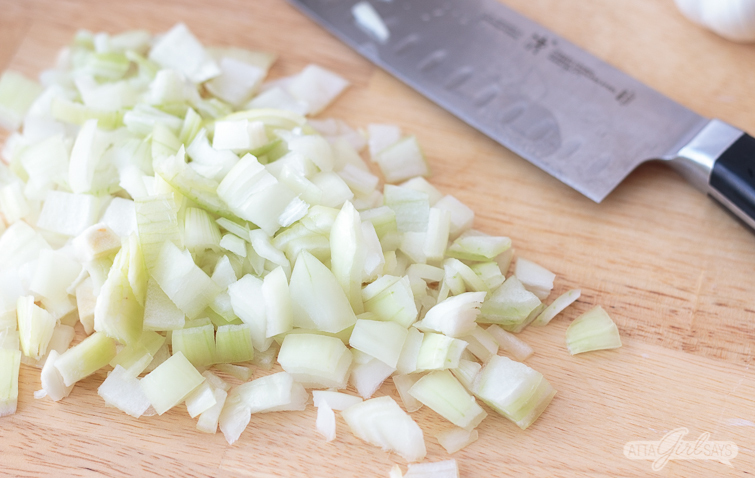 Once cooking time is complete, turn off the slow cooker and remove the lid. Boil water on stovetop and cook the egg noodles, according to the package directions. Drain in a colander. After noodles have cooked, add sour cream to the slow cooker and stir well. 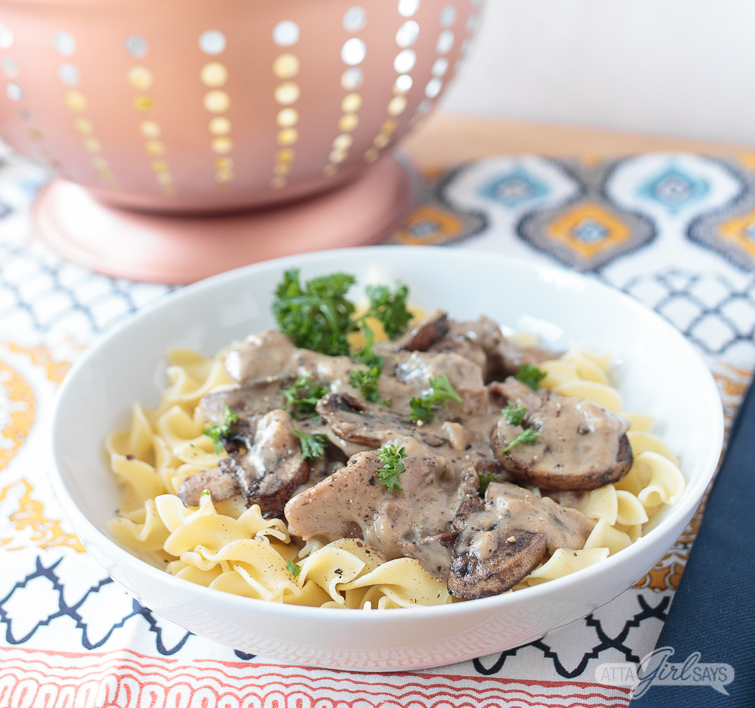 Serve beef stroganoff over egg noodles and garnish with fresh parsley, if you like. With meals like this, I’m thinking have a broken oven might not be such a thing after all. Soups, stews, slow cooker dishes and one-pot wonders are becoming our favorite dishes this winter. (This weekend, I’m pulling out my Dutch oven and making beef stew, and I think I’ll try an InstantPot version of Brunswick stew soon.